This poster was presented at the Integrated Nutrition Conference 2016 in Kenya on November 14, 2016 by Marjolein Moreaux. cultural barriers at the community level. 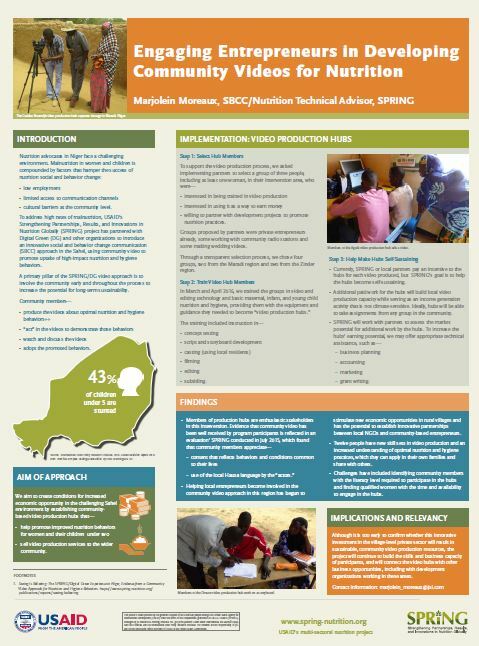 To address high rates of malnutrition, SPRING has partnered with Digital Green (DG) and other organizations to introduce an innovative social and behavior change communication (SBCC) approach in the Sahel, using community video to promote uptake of high-impact nutrition and hygiene behaviors. A primary pillar of the SPRING/DG video approach is to involve the community early and throughout the process to increase the potential for long-term sustainability. sell video production services to the wider community. willing to partner with development projects to promote nutrition practices. Groups proposed by partners were private entrepreneurs already, some working with community radio stations and some making wedding videos. Through a transparent selection process, we chose four groups, two from the Maradi region and two from the Zinder region. Currently, SPRING or local partners pay an incentive to the hubs for each video produced, but SPRING’s goal is to help the hubs become self-sustaining. Additional paid work for the hubs will build local video production capacity while serving as an income generation activity that is not climate-sensitive. Ideally, hubs will be able to take assignments from any group in the community. Helping local entrepreneurs become involved in the community video approach in this region has begun to stimulate new economic opportunities in rural villages and has the potential to establish innovative partnerships between local NGOs and community-based entrepreneurs. Twelve people have new skill sets in video production and an increased understanding of optimal nutrition and hygiene practices, which they can apply in their own families and share with others. Challenges have included identifying community members with the literacy level required to participate in the hubs and finding qualified women with the time and availability to engage in the hubs. Although it is too early to confirm whether this innovative investment in the village-level private sector will result in sustainable, community video production resources, the project will continue to build the skills and business capacity of participants, and will connect the video hubs with other business opportunities, including with development organizations working in these areas.